Minoan painting-frescoes pictures collection from greek museums Each thumbnail photo is a link to a larger version of the same photograph. 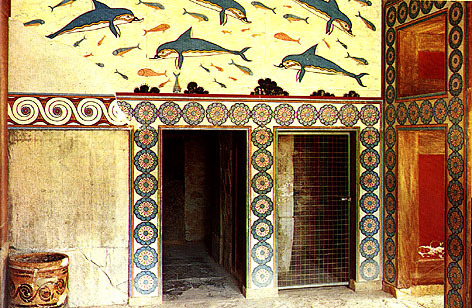 Knossos throne room. 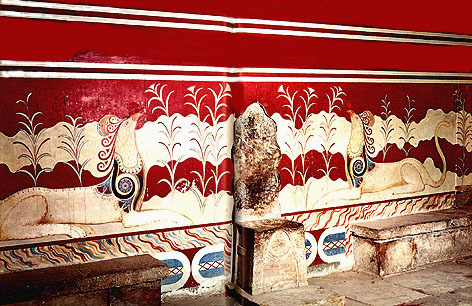 Detail of the fresco with the double epsilon 2E on the north side of the Throne room at Knossos. 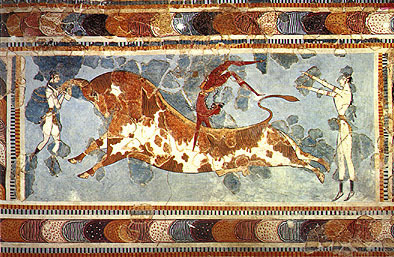 The bull-leaping fresco, which comes from the East Wing of the palace at Knossos, shows the three successive stages of the sport and thus gives us a full and clear picture of how it was performed. As the bull charges, the acrobat first grasps its horns, then somersaults on to its back and finally jumps off. Both men and women took part in this dangerous sport. 15th cent. B.C. Herakleion Archaeological Museum. 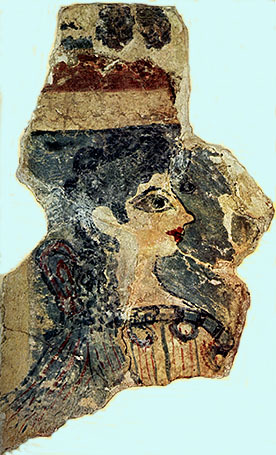 The Minoan Lady known as "La Parisienne", part of the Camp Stool Fresco, which was probably painted on the wall of the Sanctuary Hall on the Piano Nobile. The sacral knot worn at the back of the neck seems to indicate that she is a priestess or even a goddess. Neopalatial period 1400 B.C. Herakleion Archaeological Museum. The Fresco of the Ladies; from Knossos. Herakleion Archaeological Museum. Fresco with the dolphins from Knossos Queen's Hall. About 1600 B.C. 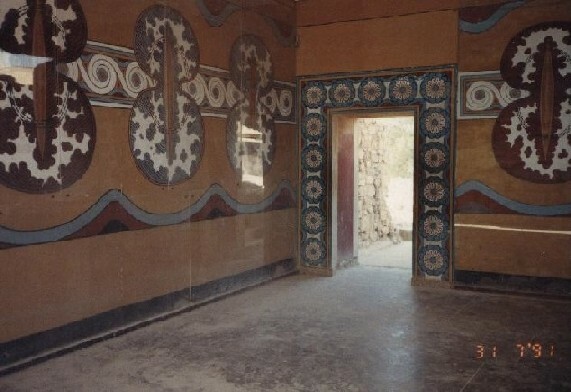 Frescoes from Knossos -the royal guard room. 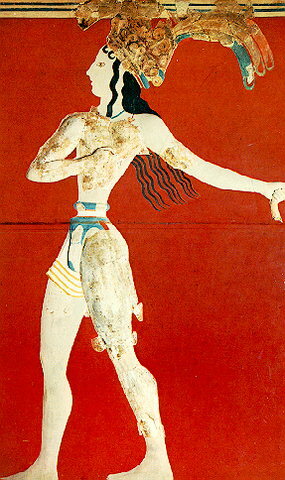 Sarcophagus fresco from a Tomb at Agia Triada, Late Minoan Period, 1390 BC. Herakleion Archaeological Museum. Frescoes from Knossos - the monkeys.